Denying the existence of the devil is quite popular these days. The concept of such a being, evil personified, is just so anachronistic; so mediaeval; so unenlightened. For the most part, the Devil or Satan has been relegated, at least in the minds of most people, to the realm of fantasy, the most common caricature is darkened features, pointy horns, tail, and pitch fork in one hand. This caricature actually takes away the suspense and even the fear. Looking like that, we can spot him a mile away. But the truth is that evil is not so obvious. If it was, we would not fall so easily into its trap. The problem is that in real life, we don’t encounter the devil or evil as portrayed in the movies. Our encounters are far more subtle—just as it was for Jesus in today’s Gospel. As much as we often downplay the power of temptation and underestimate the intelligence of the devil, most of us, even the best, would soon fall victim to his subtle ways because “his wiles are worse than his darts.” When the temptation has been planted, the bait taken, the realisation and regret often comes too late. In C.S. 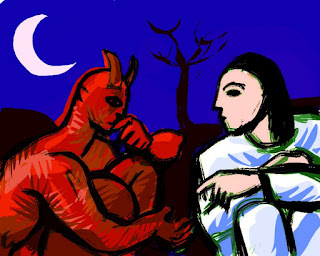 Lewis’ Screwtape Letters, the senior and more experienced devil counsels his junior, the demon Underwood, who is new to the game. Screwtape says, “The safest road to Hell is the gradual one. This is the road taken by quiet people, responsible citizens, religious people, our neighbours & even people participating in the Christian church.” The reason why the devil always seems to claim victory in his mind games with us is because he is an expert in presenting the bait, but hiding the hook; he paints sin with the colour of virtue; he is adept at extenuating and lessening sin; and finally he presents a false image of God who is All Merciful but never One who demands accountability. Evil enticements always come to us in borrowed attire. Imagine the scene of the temptation depicted in today’s gospel. Rather than the devil of Hollywood invention; here is no fanged demon obvious in its evil intentions. This is the devil of subtle trial, subtle test, and subtle temptation, not the fire-breathing, pitchfork carrying, horned beast that is the stuff of mediaeval imagery, bad dreams, and B-movie plots. He comes as an angel of light offering the peace pipe. He is the devil who hides behind our greed presented as ordinary hunger, our ambitions for power disguised as a passion for making a difference, and our thirst for popular approval hidden as a marketing strategy to turn detractors into supporters. No, the devil is not so foolish in being so obvious. He insinuates by using the logic of man, the logic of the world, and weaves it into Jesus’ own self-understanding, “If you are the Son of God…” Rather than presenting a true picture of his identity, the devil offers Jesus a skewed lie – defining theology through human ideological lenses. Today, all temptations provide us with a skewed benchmark – instead of being defined by God, instead of allowing God to be the standard of all, the devil provides reasonable and even logical alternatives. The devil does what many are attempted to do in this day and age, bring God down to our level. But the surprise is that God has already come down to our level in the person Jesus and it is Jesus’ mission to raise us up and bring us up to God’s level. The devil ensnares many good souls with a most popular moral fallacy, “the end justifies the means”. He tempts Jesus with the possibility of a quick and easy victory, one which will enable him to establish the Kingdom of God without passing through the arduous and life-threatening way of the cross. In the movie, Ender’s Game, the protagonist finally realises that he had been tricked and manipulated to perform a heinous crime of genocide over an alien race. When confronted with his subterfuge, his commanding officer, Colonel Graff, screams at our hero, “We won! that’s all that matters!” to which Ender replies, “No. The way we win matters.” The end never justifies the means. Yes, the devil tempts bad people with bad things. He doesn’t have to waste subtlety on those hooked on sin. However, the devil tempts good people with what apparently seems to be good. The devil can cloak himself quite easily in the lamb’s clothing of piety, but, wolf that he really is, distort it, either through excess or defect, thereby destroying you with what is good. One of my favourite blogger priests, Monsignor Charles Pope of the Archdiocese of Washington, provides several examples. First, the devil can distort our prayer life by making us think that God is a cruel taskmaster who demands longer and more precise prayers. Prayer is then reduced to superstitious repetitive formulas. Prayer becomes a burden rather than a willing cause of joy. Second, the devil can make us feel smug, superior, or proud of our spiritual achievements. What is beautiful and holy is thus employed to incite ever growing pride and cynicism. Third, religious observance can be reduced to legalistic minimalism. “Why do more when you do less?” Thus, in being obsessed with the tiniest dictates of moral, religious and liturgical laws, we neglect charity. We can also end up choosing the minimalistic options over more. Fourth, even the love for the poor and doing corporal works of mercy becomes a means of locking others into dependency. We end up bandaging wounds without really addressing them. Thank you! Much needed insights at the start of Lent!